When a client is reasearching for bridal portrait Charleston photographers, I am usually the one that they give the honor to curate those amazing bridal images. To me Charleston, SC that we call our Holy City delivers an unprecedented beauty of amazing backdrops in the landscape to practically create so many amazing bridal photos. ..Through the almost 2 decades of capturing these bridal portraits, I have changed my style from time to time. Lately, my style is for creating the bridal portrait that you just do not often see. 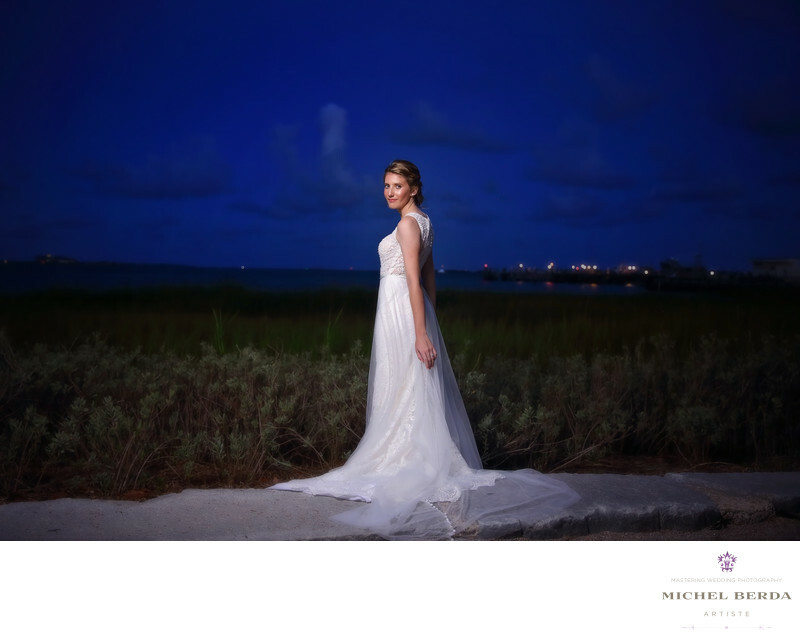 The majority of a bridal portrait in Charleston, SC that you as a client will see from any and every photographer is mostly captured during the day using ambient lighting. Being a lighting master that takes a lot of science and thought process with great lighting equipment give me a huge advantage. .. The mood of any images that we all create are usually the ones that are not just only unique in style but full of vibrant colors in the background that leaves the eyes with a sense of imagination with that feeling of a well captured bridal portrait image. In looking at this incredible bridal portrait image you have a better sense of it all. Here the dress is full of details that are embroid into the pattern. Cleary the clouds has it's on way to flatter the beautiful blue sky. All mixing perfectly for that effortless, bridal portrait captured here in Charleston, SC.Keywords: Bridal Portrait (84), bridal portrait charleston photographers (3), bridal portrait in charleston sc (3), Charleston sc bridal portrait (3), photography bridal portrait (3).